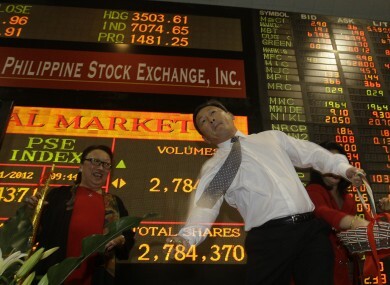 Philippine Stock Exchange director Alejandro Yu throws chocolate coins at the start of trading to mark the first trading day of 2012. STOCK MARKETS in Dublin, Europe and the US went higher on their first day of trading of 2012, boosted by lower-than-expected unemployment figures in Germany and strong manufacturing figures in the US. On the first day of trading this year, the ISEQ index in Dublin closed up just over 2 per cent, with airlines Ryanair (4.2 per cent) and Aer Lingus (3.9 per cent) helping the gains. Smurfit Kappa saw its share price raise by almost 4 per cent, while the building materials provider Kingspan saw shares rise by 3 per cent. In London, the FTSE 100 index closed up by 2.3 per cent, while France’s CAC 40 index gained by 0.7 per cent. Frankfurt’s DAX exchange closed up by 1.5 per cent – propelled by the low unemployment numbers – while even the Italian market gained 1.25 per cent. Spain – which saw its unemployment rate rise to its highest of the current crisis – joined in the fun, seeing the IBEX exchange in Madrid gain by 0.1 per cent. In the US, the Dow Jones closed up by 1.47 per cent, while the broader S&P 500 index gained 1.5 per cent. The NASDAQ also benefited, up by 1.67 per cent. Commodities were up – gold by 2.5 per cent, oil by 4.3 per cent – while the dollar fell against the euro, yen and sterling. Email “Stock markets close up on first day of 2012”. Feedback on “Stock markets close up on first day of 2012”.